IOC chief Thomas Bach has called for an external candidate to run for the FIFA presidency. International Olympic Committee president Thomas Bach has declared "enough is enough" over the FIFA scandal and demanded that football’s world governing body considers a "credible external candidate" as president to help clean up the mess. Bach’s declaration came after FIFA president Sepp Blatter and UEFA president Michel Platini were both provisionally banned for 90 days by FIFA’s ethics committee pending investigations into a £1.35million ($2m) payment. Bach’s intervention is hugely important – football is desperate to remain in the Olympics and he wields significant authority in global sport. 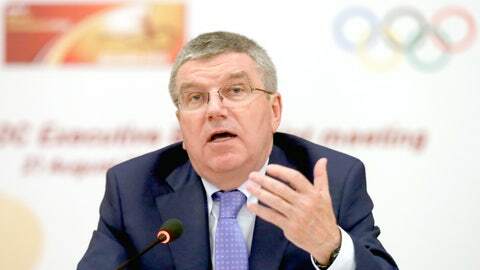 The IOC president said in a statement: "Enough is enough. We hope that now, finally, everyone at FIFA has at last understood that they cannot continue to remain passive. They must act swiftly to regain credibility because you cannot forever dissociate the credibility of FIFA from the credibility of football. Britain’s FIFA vice-president David Gill has called for an emergency meeting of the organisation’s executive committee – but the Football Association has not formally dropped its support of Michel Platini. The FA’s support for Platini is a cause for some embarrassment for the governing body, but it did say questions need to be answered by the Frenchman. An FA statement said: "David Gill, the British member of the FIFA executive, along with Wolfgang Niersbach, the German representative, have today called for an emergency meeting of the FIFA executive to discuss this morning’s events. They are conscious that both the president and general secretary of FIFA are currently suspended. "We also understand there will be a meeting of the 54 UEFA nations as soon as next week. "The FA committed this summer to supporting Mr Platini in his bid to become the next president of FIFA. At the FA Board meeting last week, we decided that remained our position while inquiries into certain allegations were being investigated. "We now await the results of both the ethics committee inquiry and the investigation of the Swiss Attorney General. We note that Mr Platini has issued a strong statement protesting his innocence." The statement added: "This is an extremely disappointing day for football. We trust the FIFA Ethics Committee will conduct the investigations in an independent, robust and timely manner. As we said last week, there are key questions that have arisen in the past month that must be answered by those concerned." Sports minister Tracey Crouch said Blatter should resign immediately. She said on Twitter: "Pleased to see ethics committee suspend Blatter. His time at the top is up. He should resign now and let real reform at #FIFA begin."